When you have a motorcycle, it isn’t long before you start planning to take a trip on your bike. You are going to need a sissy bar bag to store your essentials on your trip. 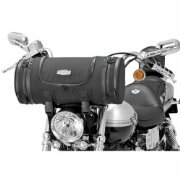 Even if you aren’t taking a trip, sissy bar bags for motorcycles can come in handy for carrying things you’ll need during your travels. 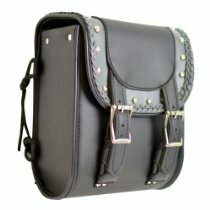 What is a sissy bar bag? It’s simply a bag that is strapped to your bike’s sissy bar, the metal bar on the back of your motorcycle. Sissy bar bags allow you to store and transport items. In short, it’s luggage for your bike. See the sissy bar bag in the picture here. 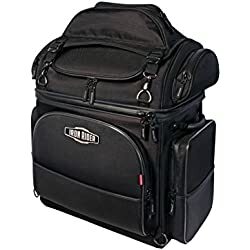 This page will talk about some the more popular sissy bar bags for motorcycles – from big luggage travel bags for long trips to small/everyday roll bags (that can be used like a backpack) made from leather and nylon. 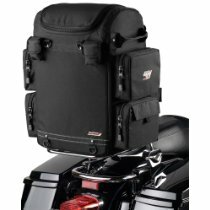 We share some great motorcycle bags that are both hard bags as well as soft from great brands like Saddlemen, Kuryakyn, Riggpaks and more . We’ll discuss stitching, straps, zippers, and water proof qualities, studs, fringes, braided and more. 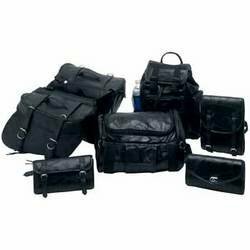 Whether you have a BMW, Suzuki, Yamaha, Honda, Kawasaki, or Harley Davidson motorcycle, you’re sure to find a great deal on the perfect sissy bag for your bike here. 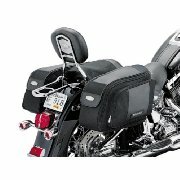 Sissy Bar Bag or Saddlebags for Your Motorcycle? For many bikers, this is the big question – should you get a sissy bar bag or saddlebags? Or both? 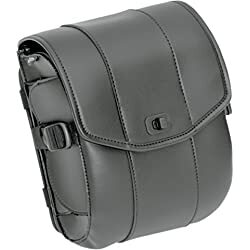 There are pros and cons of each – saddlebags stay on all the time and can be locked securely – buy sissy bags can come on and off so it’s easy to carry your stuff when your OFF the bike when traveling (going into a hotel for the night, for example). 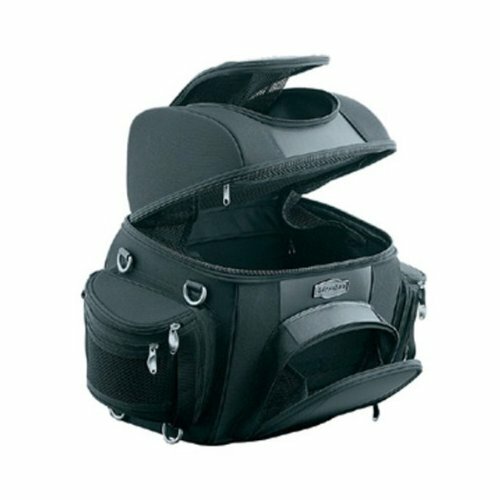 After checking around with other bikers, it seems most motorcycles owners have BOTH because saddlebags and sissy bar bags each serve their own unique purpose – meaning it’s not really an either/or question at all. The size of your sissy bag depends on how many items you’ll try to fit in there. 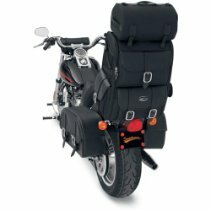 If you’re taking a trip, you might need a larger sissy bar bag than if you’re just taking your motorcycle for a quick ride. Size is something you have to be careful about. Obviously, if the sissy bag is too small, you won’t be able to carry some things on your motorcycle. 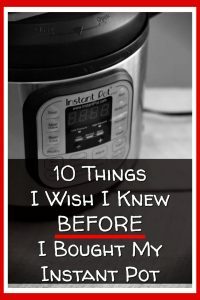 That may make you feel as if the bag isn’t worth it. However, if the bag is large, you have to be sure that it straps in well and doesn’t cause your bike to become difficult to handle. 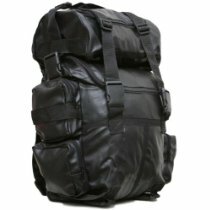 There are a number materials that can be used for sissy bar bags, but the two materials primarily used are leather and nylon. Leather looks sleek and stylish on any motorcycle, but nylon/synthetic typically has a longer life. Think about what kind of weather you are likely to encounter on your motorcycle, and that will help you make a decision. Don’t let price be your overall deciding factor. 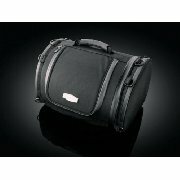 For example, Kuryakyn motorcycle bags tend to have a higher price tag, but they very well-rated and high-quality. 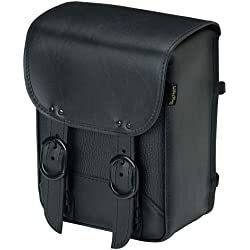 Saddlemen motorcycle bags also carry a higher price tag, but they also make some of the best sissy bags you can get. 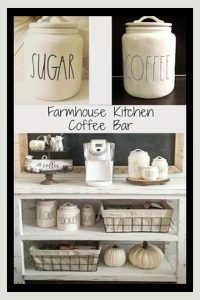 T-bags and Tourmaster are also good brands to check out. 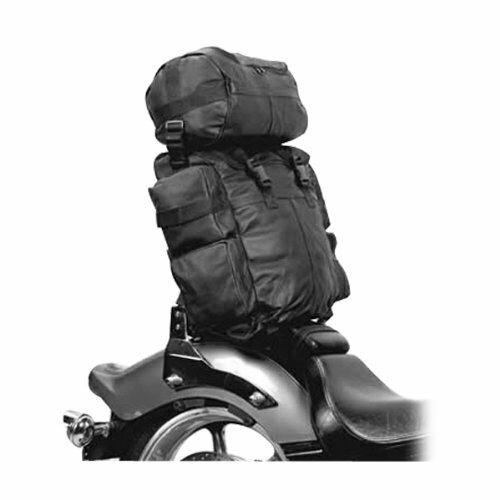 You need to be sure that any motorcycle bag you use can be easily and securely attached to your bike. 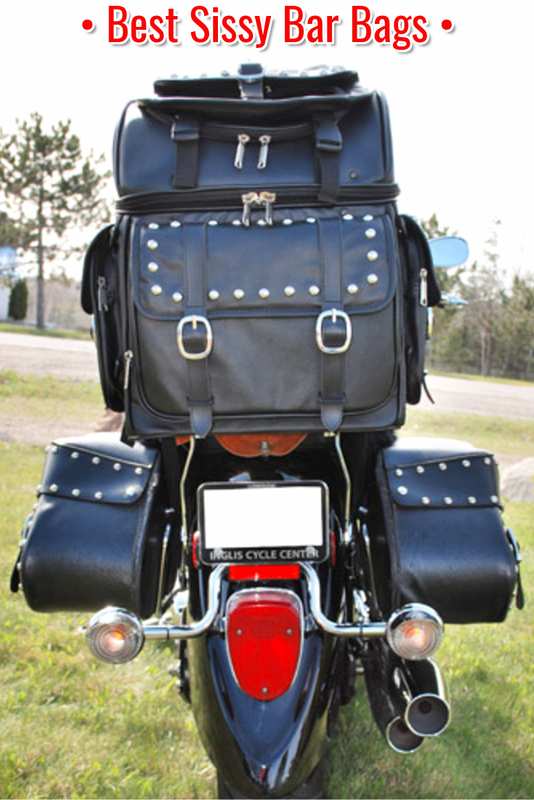 When you choose a bag for your sissy bar, be sure that you can put it on and make sure that it stays on. After all, you don’t want your things falling all over the road when you hit a certain speed now do ya? See the Sissy Bar Bag in the video here. You need to consider whether your sissy bag will have a lock or not. If not, anyone could walk by and take your things out of your bag, if they don’t walk away with the bag itself. Think about this possibility before you buy a bag, so that you are aware of how you can protect it. 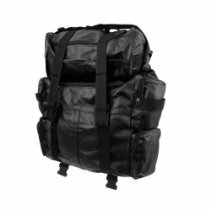 Try to get a bike bag that has some kind of security features. Knowing your stuff is safe is worth the extra price of a lock. 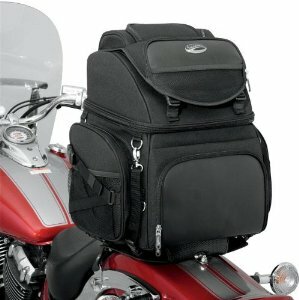 Make sure that your sissy bar bag has extra pockets and other features that make it a convenient bag to have with you. With good quality zippers and clasps you should have no trouble getting something out of the bag quickly. Taking the time to seriously consider your needs when buying your sissy bag is important because if you make the wrong choice, you’ll be dissatisfied with your purchase. Think about your sissy bag as a good piece of luggage that you expect to last. This is not the time to go cheap (remember, you get what you pay for). 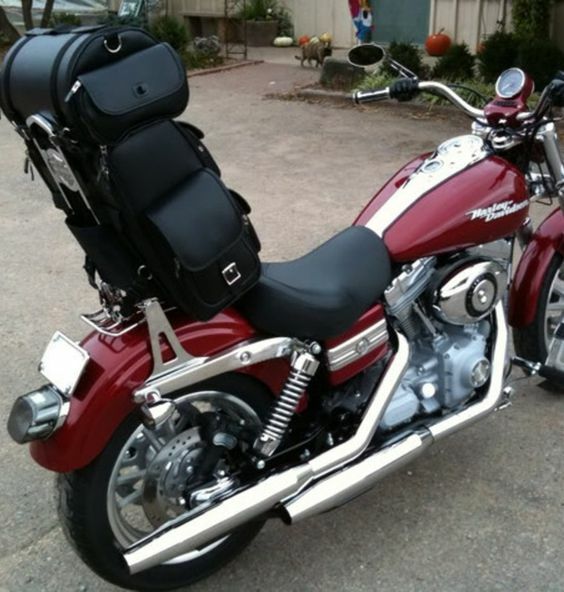 Read reviews to see what other bikers and cruiser owners think of their sissy bar bag – check and see if they went for bags from Saddlemen or from Kuryakyn. All this info will really help you find the right sissy bag for you. For example, if you buy a sissy bar bag that is too big, you’ll throw off the balance of your bike and handling it can be a problem. Not only that, but a bag that is too heavy with your items is likely to cause strain on your sissy bar. In extreme cases, your sissy bar could bend or break. A good sissy bar bag is one that is water-resistant (remember to get a cover if necessary), attaches and comes off easily, and allows you to get to your belongings without too much trouble. When you get a bag, make sure that it has all of these qualities, so that you are able to go riding. Now that you know a bit about sissy bar bags for motorcycles, you need to know where to buy them. You can purchases some through the company you bought your motorcycle from, for instance. They likely offer a number of accessories that will fit your bike perfectly. However, the bags they offer might be more expensive than you want to pay, or they may not be the style you’re looking for. That’s why a great place to get sissy bar bags for motorcycles is on the Internet. When you go shopping online, you are much better able to find a bag that fits into your budget. Not only that, but there are countless styles available. You are able to browse bags at your leisure, so you can choose the perfect bag for you after a few hours. 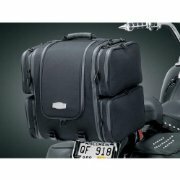 How can you find the best deal for sissy bar bags for motorcycles online? The easiest way is to just do quick search for “sissy bar bags”. You’ll find hundreds that way. However, that might be overwhelming, as you have no point of reference. You might not be sure which sites have better prices, or you might not want to wade through hundreds of sites. That is why you may want to consider joining online forums for bike riders. You can join a forum for bikers in your area, or you might look for online forums for people who own your particular brand of motorcycle. Forums can be a great way for you to avoid endless searching. The bikers posting in those forums will have suggestions for you about which sites are the best to buy from. 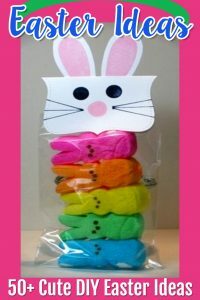 They can also offer tips on buying a bag, and they can tell you which bags have worked well for them. 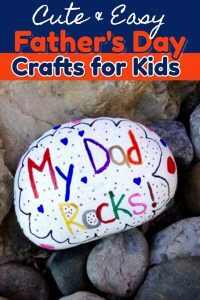 Talking to others who share your hobby can be fantastic. 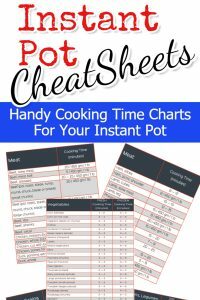 It saves you a lot of time and you get a lot of information that way. 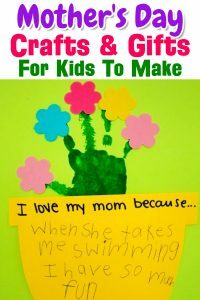 You can also share what you know with them. 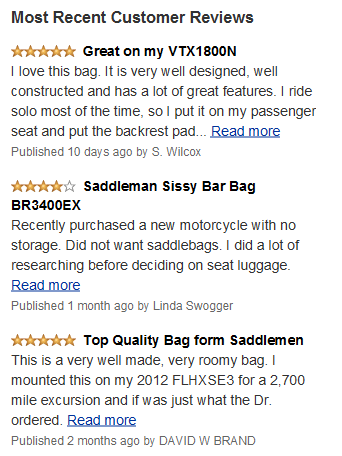 Also, take some time and read the reviews on the sites that sell these sissy bar bags. 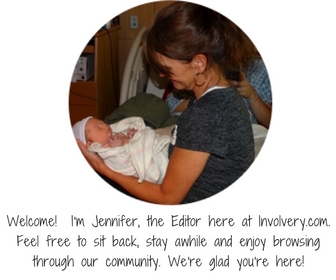 Real feedback from REAL consumers is invaluable when making a decision. 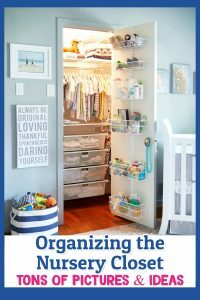 Once you have a specific site and bag in mind, it’s a good idea for you to check around the internet and see if there are any coupon codes out there. Free shipping coupons and discounts are not uncommon, so make sure to check before placing your order. Make sure you know about the refund policies of the company you are buying from. 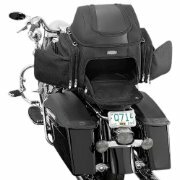 Sissy bar bags for motorcycles can be a great addition to your biking life. Use the information above to help you make a good decision about which to buy. Once you have your bar bag, you’ll wonder how you ever did without it.